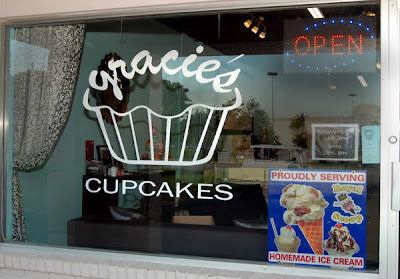 There are cupcakes, and then, oh my, there are Gracie’s Cupcakes! What a difference compared to ones you’ve in the past. 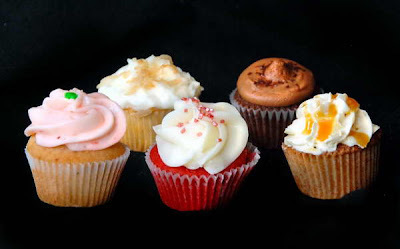 Each of Gracie’s lusciously fresh cupcakes is a perfect portion of delicious cake and icing. My friend Laura brought by a dozen mini cupcakes, and by the time I polished off the eighth, I drove straight to Gracie’s and started on a half dozen full size ones. I then returned for yet another half dozen, a few days later... you see where this is going…and Gracie keeps bringing out new recipes! 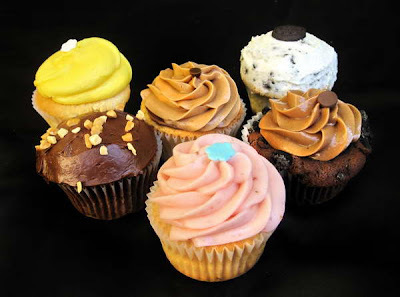 The cupcakes, baked fresh every day, are super moist – each one’s icing is uniquely different in texture and taste. Five mini cupcakes below, left to right are the Strawberry Cake with fresh sweet strawberry icing, Orange Coconut, Red Velvet, Dark Chocolate, and Brown Sugar Caramel . The Orange Coconut is a coconut milk cake with orange-flavored creamcheese frosting, sprinkled with toasted flakes. Red Velvet is a Southern classic, with a pinch of cocoa, and creamcheese frosting. The Hazelnut Chocolate Swirl has hazelmut chocolate swirled in a vanilla cake, topped with a hazelnut chocolate layer and then a light hazelnut buttercream frosting. Brown Sugar Caramel. is a moist brown sugar cake with Madagascar vanilla buttercream frosting, drizzled with luscious homemade caramel and a pinch of sea salt. Chocolate Peanut Butter, Lemon, Hazelnut Chocolate Swirl, Cookies and Cream, Mudslide and Strawberry Cupcakes Two of several Fresh Baked Cupcake Towers Grace, formerly in computer software consulting, wanted a business that gave her time with the kids, and a business that was rewarding in many ways to her. 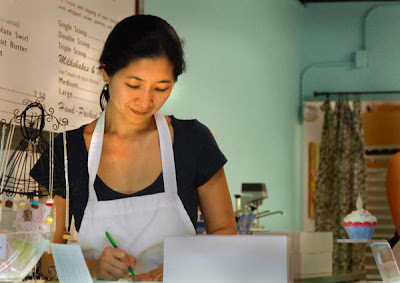 With her creativity, pleasant manner, and amazing baking skills, this career move is superb for Grace, and for you and me. I used to bring a nice bottle of wine when I visited friends, now it’s wine and a box of cupcakes, and I may soon be asked to ditch the wine, and bring more cupcakes! 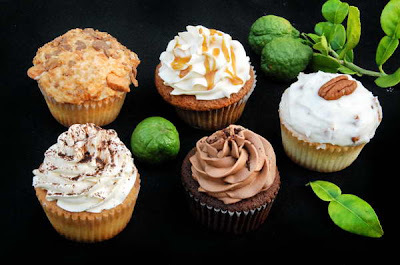 Below, from front left, back, and across are Tiramisu, Butterfinger, Brown Sugar Caramel, Vanilla Buttered Pecan, and Dark Chocolate, with kaffir limes for color. 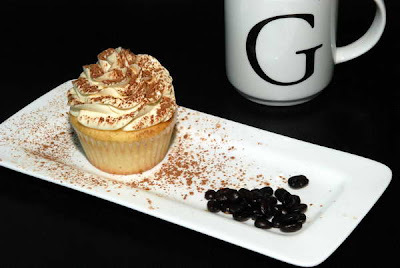 The Tiramisu is a coffee infused vanilla cake with a light Madagascar vanilla buttercream topping. Buttercream is not as sweet a frosting as other frostings. The colorful Butterfinger is my favorite, as it’s my favorite candy bar! It’s a vanilla cake filled with rich peanut butter buttercream, and a creamcheese topping sprinkled with crunchy Butterfinger chocolate and peanut butter chips. The toppiing is sweeter and richer than a buttercream topping. 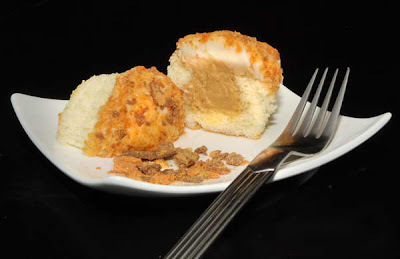 Vanilla buttered Pecan is a vanilla cake topped with buttered toasted pecans folded into cream cheese frosting.. Dark chocolate has velvety dark chocolate icing on rich chocolate devil’s food cake- very sweet! Tiramisu with its Coffee Beans and Gracie’s cup A Trio of Strawberry Cakes with Fresh Strawberries The peanut center of a Butterfinger Cupcake! 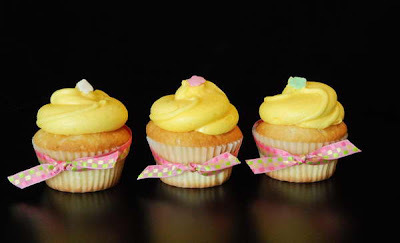 Lemon Cakes-light & fluffy with a sweet lemon frosting made with freshly squeezed lemon juice. 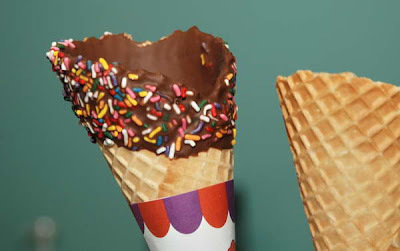 Ice Cream Cone, ready for Royal Scoop’s Ice Creams Ice Cream may be enjoyed by the scoop, cone, cup, sundae, or taken to go. 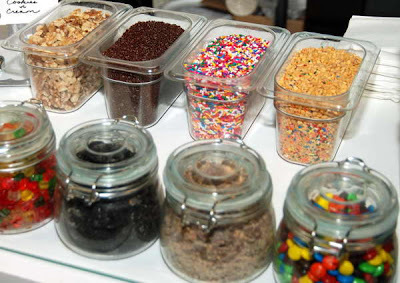 There's no shortage of toppings! Gracie, writing down a new cupcake idea. Customers Erick, Leo and Marco Open 11 a.m. to 9 p.m. Monday to Saturday and noon to 8 p.m. on Sunday. The day I read this review I was in Gracie's ordering a dozen cupcakes for the office. 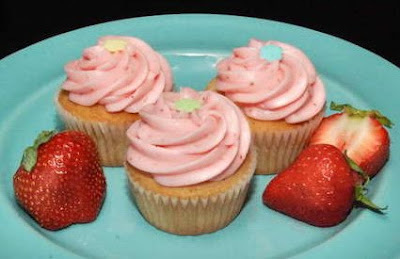 I LOVE cupcakes and they are one of my own favorite things to bake. We got a variety and my two were the chocolate peanut butter and the butter pecan. The peanut butter one was so rich. I ate it slowly with a fork and enjoyed each bite. The butter pecan was fabulous as well, but I am a huge chocolate person. The consensus around the office was that the cupcakes were wonderful, but not superb. I don't know about them, but I will be visiting again! Love Gracie's cupcakes, and she has creative ways of adding special touches for my needs. There's something about a cupcake, which makes everyone smile. Thank you for sharing a sweeter side of Naples dining and desserts. Love your blog! Please take a ride further down the East Trail and sample Simply Cupcakes. I'll be curious to know whose you like better. 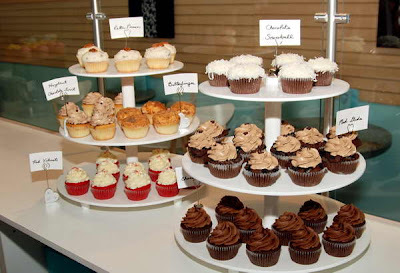 I have sampled so many cupcakes in naples, from book stores to Gracie's. After trying a cupcake from simply cupcakes I wasnt sure if I wanted to go to Gracie's or not, but my husband and two children convinced me otherwise. When we walked in we were greeted by a super friendly employee and the most heavenly smell. I ordered a butterfinger cupcake for myself, a tiarmasu for my husband, and a vanilla cake with chocolate frosting for my two sons. We ended up eating two cupcakes each and took home a dozen. These were by far the best cupcakes I have ever had. 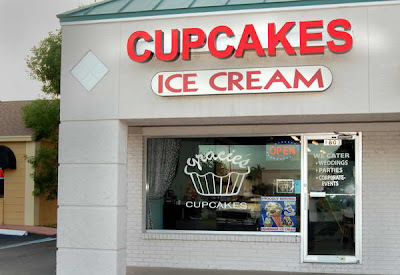 I will be going in there today to get my fix! 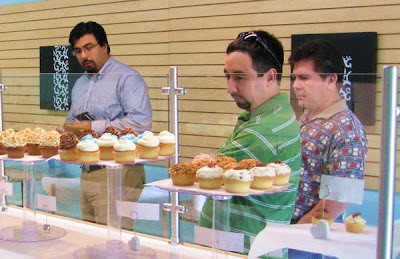 I've had the chance to sample all cupcakes at three naples bakeries. Being a baker myself, I expected good things from all three. Gracies was by far the worst. Of the 6 flavors I tried not one was good. The cakes were flavorless and dry, the icing was gritty. Possibly some of the worst cupcakes I have ever had. Save your money and time and get a pack from Publix...they'll be better. Sassy cakes was much better the icing was smooth (with the exception of the cream cheese, which was gritty) the cakes were moist. Simply cupcakes were very good. The key lime cupcake is not to be missed. Though I would avoid the cannoli..there was an off taste and texture to it. Best butter cream! Do Click "OLDER POSTS" or "Newer Posts" -above this line- for prior or later entries!